I haven’t much storage space in my small bathroom so I keep my extra toilet paper rolls in the hall linen closet, which is not the most convenient, especially for visitors when the roll runs out. Keeping an extra roll of TP on the vanity or on the back of the throne presents a situation of possible splash accidents, like when my cats get in a mischievous mood. This quick project is the perfect storage solution, and it will be most appreciated by guests who won’t experience an awkward moment if the roll runs out. I used two different remnants of 42” wide, 100% cotton Timeless Treasures prints. You can use a heavier fabric, such as for upholstery that will hold up well for daily use, but considering the holder will likely be laundered routinely, I would avoid any fabric that you must dry clean. To reinforce a lighter fabric, I used a no-show poly-mesh cut-away, but you can use any flexible stabilizer between the panels as long as it also supports the embroidery, like an iron-on stabilizer or a 1.5 OZ tear-away. All it takes is less than a half-yard total for the two panels and ties necessary for each holder. The length of the toilet paper core, determines the yardage, and the amount of slings that you want to make determines the necessary fabric width. The circumference of the toilet paper roll that you generally use determines the length of each holder. If you create only one sling using the same print inside and outside, you would likely get by with about 8” of fabric that is 42” wide. A 3-sling holder requires a 64” fabric width. 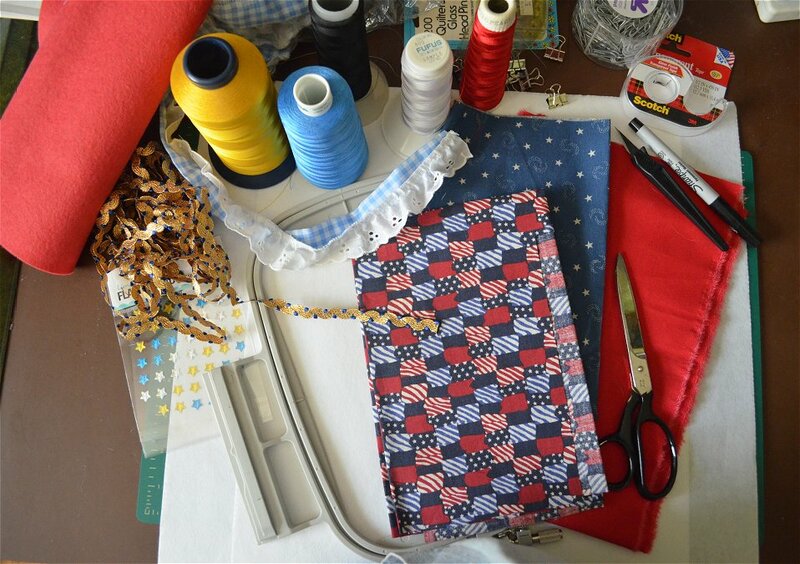 (If you plan to make more than one 2-sling holder, you can reverse the measurements, using the yardage for the length of the holder and cut about six panels 6.5” wide and six strips 1” wide for ties from 1 yard that is at least 42” wide to create three 2-sling holders.) This pattern is for creating one 2-sling holder. 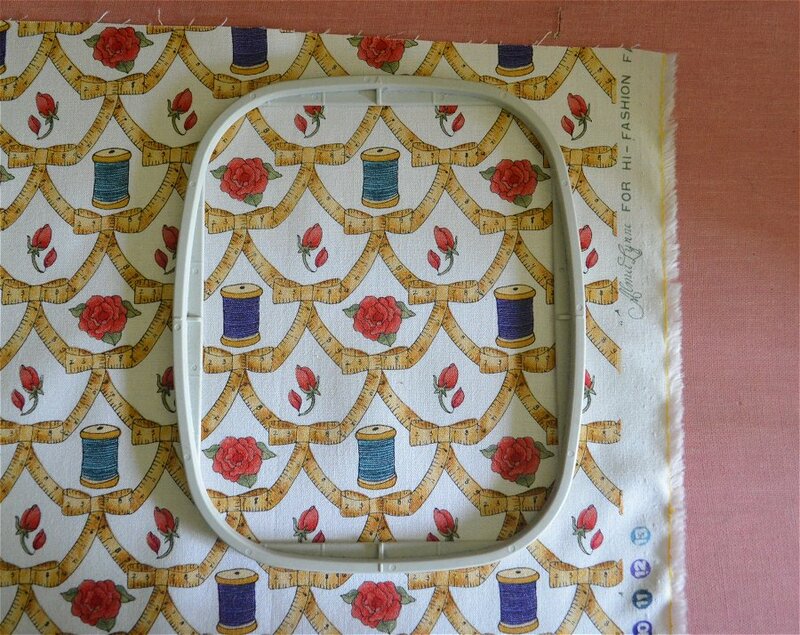 Test sew your designs and create a template by marking the inside edge of the hoop, then cut along your mark line. This is a good time to make note of possible problems. My sample shows how a tail of green was tacked down by the yellow in the left flower. Be sure trimmers are turned on or if you are stitching with a machine without trimmers, you should stop the machine after the jump to trim away the excess tail. Gather your materials, determine the measurements and cut. This pattern calls for the sling to hold the standard size roll that measures about 4” from the top of the core to the bottom of its core. To be sure that the sling will hold your favorite brand of TP, measure the length of its core and add 2.5” and the sum will determine the width of the panel. Determine the length of the panels for a 2-sling holder by measuring the circumference of the TP roll, double that number and add 6”. Cut two panels of fabric accordingly; my two cut panels measured 6.5 x 36”. Cut two 1” x 30” strips for ties. Alternately, you might also use ¼” wide ribbon for the ties. Pre-assemble and mark. With a roll of TP inserted in each sling, assemble top panel to the inside with stabilizer on the outside. You can also accomplish this with the fabric right side out, but I prefer to hide marks whenever possible. Pin and mark between the two rolls where your final center seams will stitch (approximately 8 ¼” up from the fold); this will not be at exact center because you need an allowance at the top of the holder for top seams. 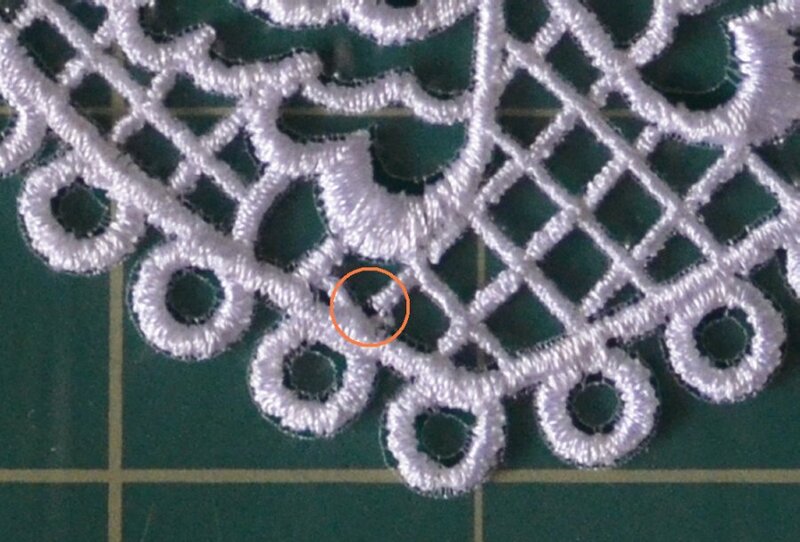 Determine and mark an X at where you believe the center point of the embroidery design should be. Un-assemble and use two pins crossed on the right side to mark each design center, matching up the pins to your marks on the stabilizer. Pin the templates to the right side to help placement when hooping, matching up the center of the design to the crossed pins; a roll of TP will help judge whether designs will be centered. Hoop around where the template is pinned and then remove the template, line up center on the machine, and then remove the pins and stitch. Note: I included a margin of stabilizer on each side to accommodate the size of the hoop I used and it’s cut away after the embroidery. If you use a smaller size that allows hooping all fabric securely, this excess margin of stabilizer is not necessary. With right sides together, pin the inside and outside panels together and sew a 5/8” seam around each side, leaving an opening at one end. Trim corners and turn. Use the blunt end of a knitting needle to help push out corners. Press. Create ties. Fold and press each long edge to meet at the center, and then fold and press in half along the length. Pin and sew a narrow seam, stitching close to the edge. Fold the stitched panel in half, right sides out, and pin at top. Fold the ties in half and place the folded ends between the two sides of the panel, in about 1” from the top of the holder. Pin and stitch a narrow seam at the top edge. Stitch another seam about 3/8” down from the top seam. 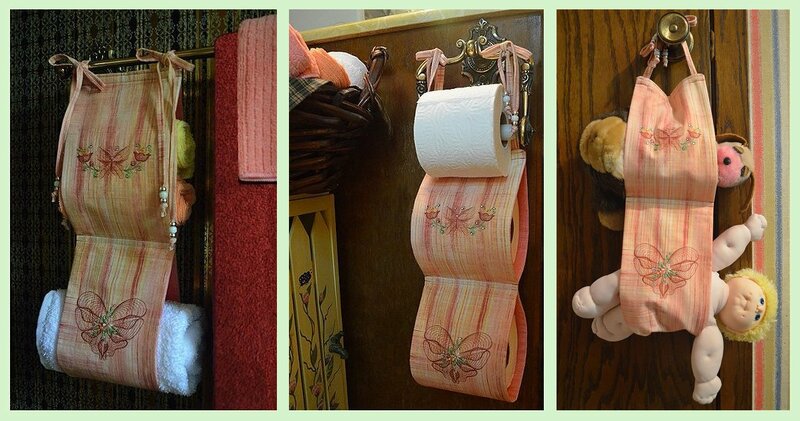 Tie to a door knob or clothes hanger with rolls of TP inserted to double check where the center seams should be. Pin and stitch two seams across the center about 3/8” apart. Optional: Add gems where preferred, fastening with Gem-Tack or other fabric glue. Thread the ends of the ties through beads and knot the ends. 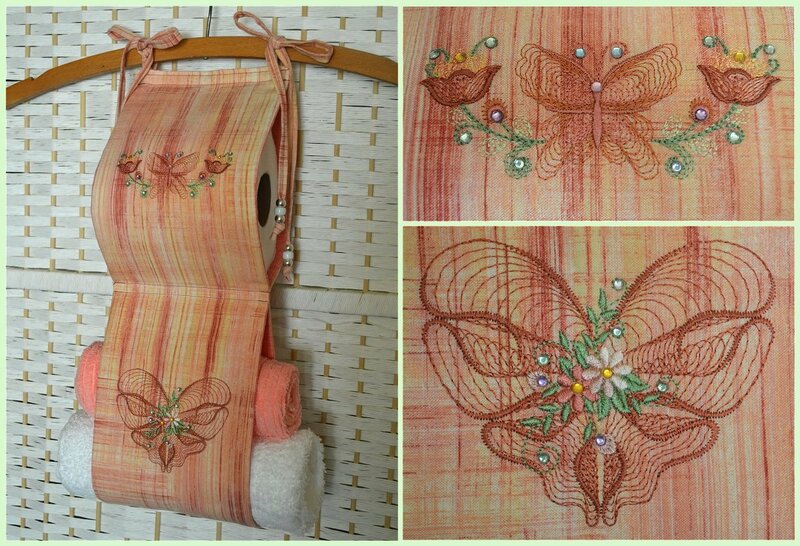 The finished “thing sling” is pretty enough for Aunt Sallie’s visit and handy enough for everyday use. A great storage solution and organizer, it can also be used in the kitchen for tucking away towels and gadgets, tied on a bed post to hold a book, hang from a door knob to organize toys, or use in any room to hold just about anything that fits in the sling. ~ Till next time, keep on stitchin’! Want to kick back and read a book or watch a movie on your gadget? Need a helping hand while you munch on popcorn? 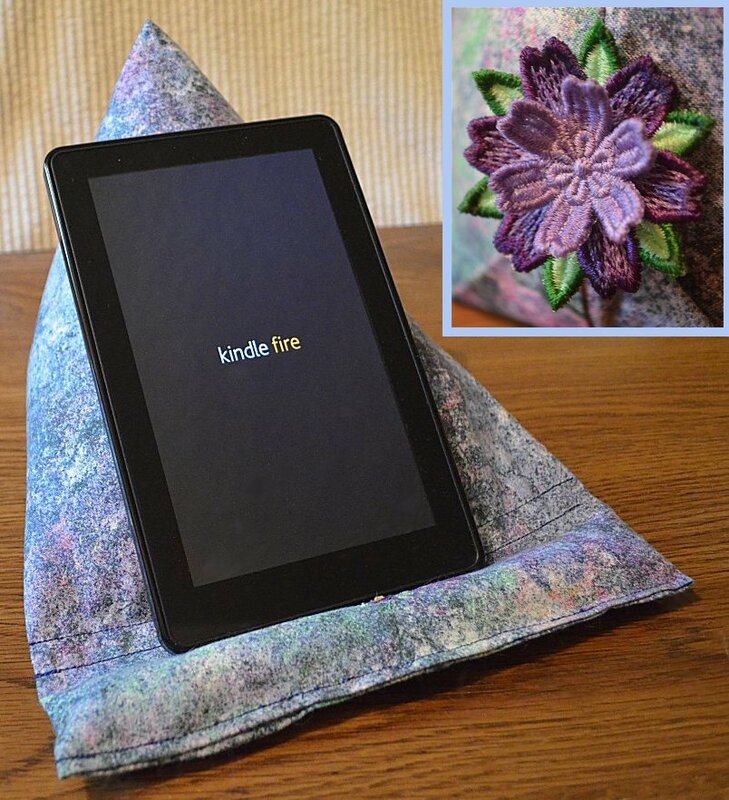 After struggling with my Kindle Fire’s leather case to sit at a comfortable angle, I discovered the perfect solution that works beautifully for me – the pillow tablet stand. This handy little resting place works great for phones, pads or tablets and readers of all sizes. Best of all, this is a breeze to make! 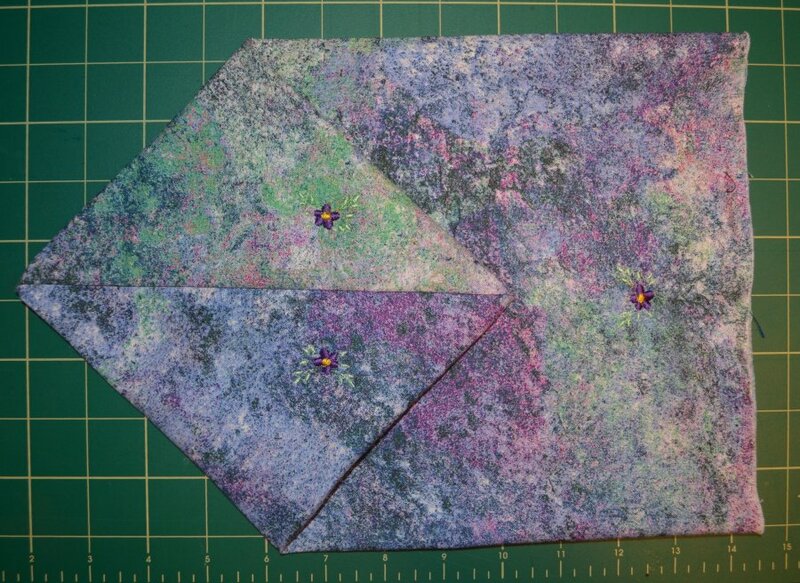 The pattern consists of one 12×18” piece of fabric sturdy enough for stuffing and everyday wear. If you want the stand to have a flexibility like a bean bag chair that can somewhat mold to the form it’s holding, or to the form where it’s resting, such as your lap, the stand can be stuffed with sand, beans or crushed walnut shells. Or if you want a more firm stand it can be stuffed with fiberfill. But keep in mind, if you use a lighter stuffing, you must also add some type of weight like a rock to keep the stand anchored; and if a rock is used, it’s best to pad the bottom of the stand with a piece of cardboard cut to fit as a base. I preferred to use the crushed shells I had left from the Nutty Pillow-Style Pin Cushion project, so no weight or cardboard base was necessary. When something is this simple, I can’t help but add embroidery somewhere. I stitched on a few small flowers but it didn’t seem to be enough. I wasn’t happy with the button I’d first used to embellish the back side and by the time I’d decided to add more embroidery it had already been assembled. What to do? 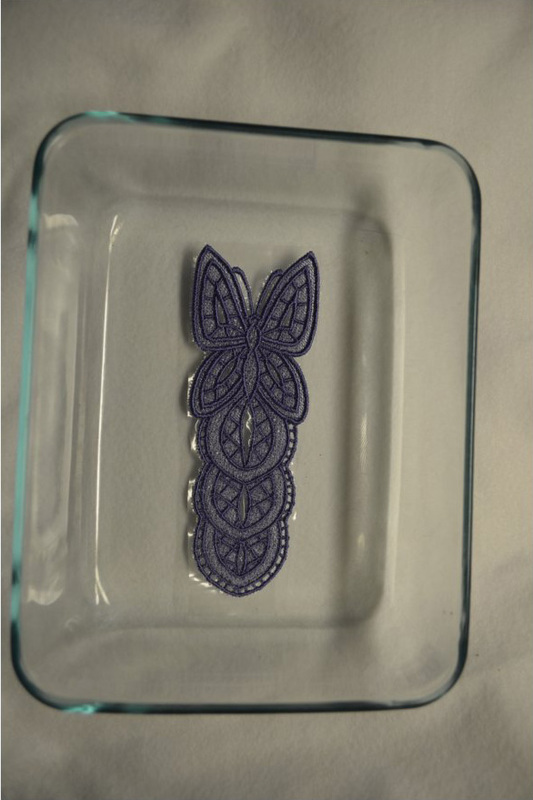 My solution came in the form of a 3D freestanding lace (FSL) design. If you choose to do the same you will find more instructions for FSL in my blog post What Makes A Design FSL? Stuffing: 6 cups crushed walnut shells (or 1 bag polyester fiberfill with rock or other weight). Gather materials and choose thread colors. Cut fabric to 18” long and 12” wide. Do not count the salvage in the measurement, but it can be left to secure the seam, as explained in Step 4. Stitch a sample of the small flower design to use as a placement template; mark around the inside of the hoop prior to removing the hoop and cut away excess to create the template. Mark design placement as seen in the illustration at right. If you’d like to embroider on the front pillow rest find the center of the fabric about 9” from each side, and up about 2” from the end. If you’ve chosen to make a larger or smaller size stand, you can determine a balanced placement on the back of the stand: with right sides together, fold lengthwise (matching up edges of print; do not include salvage). Pin a few places along the length and along the back side, and then turn right side out for a general idea of how it will be assembled. 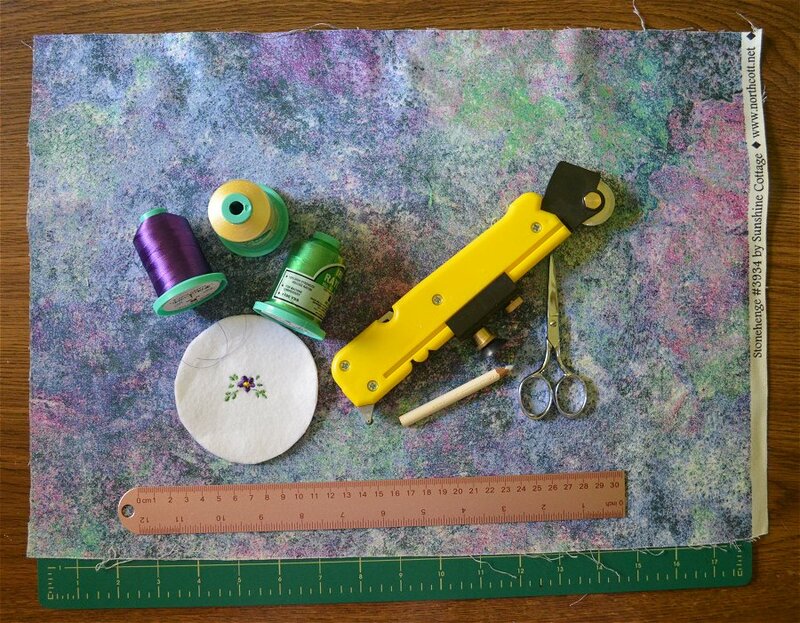 Lay the sample template on the fabric where you want the flower to stitch, fold back the template to find the approximate center, and then mark the spot, using chalk, pencil, crossed pins, or Target Stickers. Turn and remove pins. Measure from the fabric printed edge to the marked design center, and use this measurement to mark placement for the opposite side. Pin the template so that the center of the design is positioned over the marked X. The template should be pinned on the mark in the direction it will stitch. Hoop fabric with one sheet of stabilizer, and place the hoop so that the template is sitting inside. Remove the template and embroider design. Do the same with the remaining designs. Stitch bottom seam. With right sides together, match up the printed edges and fold the salvage over to create a secured seam; this will add protection against wear and keep any loose fill or weights you may have used from pushing through the stitches. Press, pin and stitch a 3/8 ” seam to close. Turn and lay open with the bottom seam at center. With the no seam side up, fold down the back to the shape of a diamond as seen in image. Stitch the bottom flap. Fold the outside tip of the diamond to the inside about half-way to meet at the diamond’s center and mark along the fold, and then stitch along mark. My seam resulted about 2” from the outside tip. Fill one shopping bag with 6 cups of crushed walnut shells or other heavy fill like craft sand and close top with a rubber band, leaving enough room in the bag to allow movement of fill and flexibility. Trim away the top of the plastic bag, leaving about a 2-3” excess; set the portion that is cut away to the side. 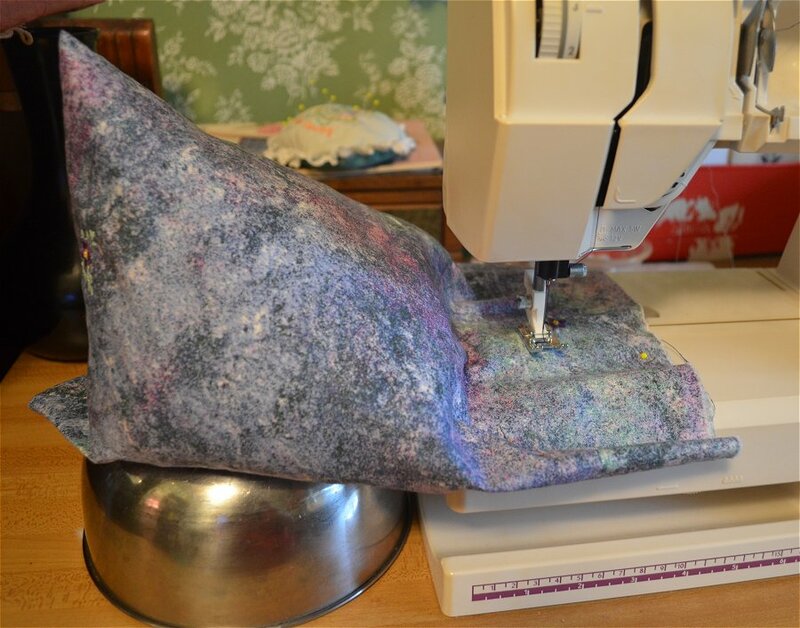 If you would rather use fiberfill, no bag is necessary, however, at this point you will need to add a rock or other heavy item at the center bottom to add weight and keep the stand stable. Stuff the filled shopping bag into the opening of the stand with the top excess of the bag tucked up into the back top tip. 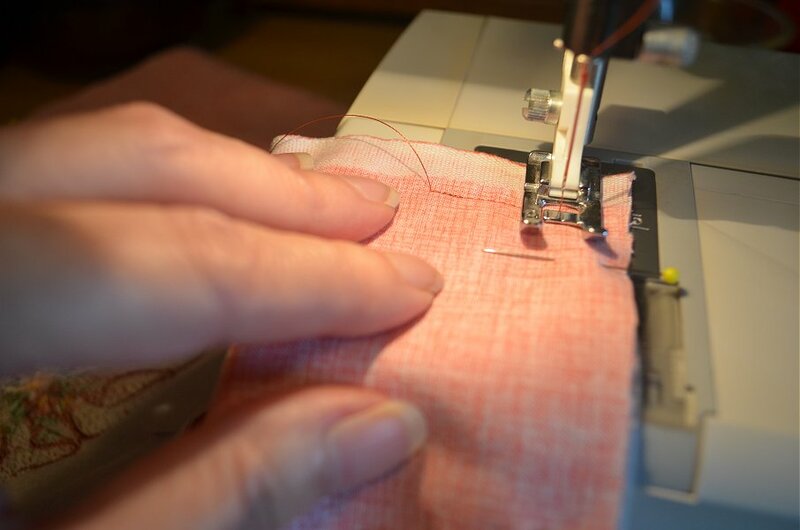 Push it in as far as possible and pin about 3″ up from the open edge to hold back the stuffing while sewing the closing seam; pin along open edge to keep one side from shifting while you work and if preferred, mark a line as a guide where you will stitch. Stitch the closing seam. Setting an object under the filled part of the stand will help as you guide the bag slowly to stitch the seam. Stitch another seam across about ½” away from the closing seam. This will result in the ditch where the bottom of the tablet rests. Make the plastic bag filler for the front pillow rest. Cut a rectangle portion about 14×6” from the plastic you had set aside. Lay across the area to be stuffed for the resting pillow. Spread about ½ cup of filler across the strip. If you want to add a scent, sprinkle about a tablespoon of scent booster across the top. Wrap and tape on each end to encase the fill. Roll the remaining plastic bag up and tape together with the first plastic roll; cut away the excess. Or you can alternately stuff with fiberfill. Fold in the ends of the stand, leaving 2” from the outside closing seam to the fold and press. Stuff and stitch to close along the edge. Fold up and tack the flap to the bottom back of the stand and add button to create a holder for a tablet stylus. Stitch the 3D FSL design on a heavy water soluble stabilizer like Badgemaster. Rinse and lay on a paper towel to dry. Lift the smaller section of petals just a little with your finger tip to keep them from sticking to the paper towel and they will naturally curl upward as they dry. Assemble the two sections of petals with a dot of fabric glue. Tack the assembled 3D flower to the back of the stand with a few stitches; you can also add a few dots of glue to help hold it in place. I also discovered that the flap makes a mighty fine place to tuck a stylus – a plus for me, because that’s something I’ve been known to lose in the popcorn bowl. ~ Till next time, keep on stitchin’! The leaves are turning vibrant shades of red, orange and yellow, indicating it’s nearing the end of the harvest season. 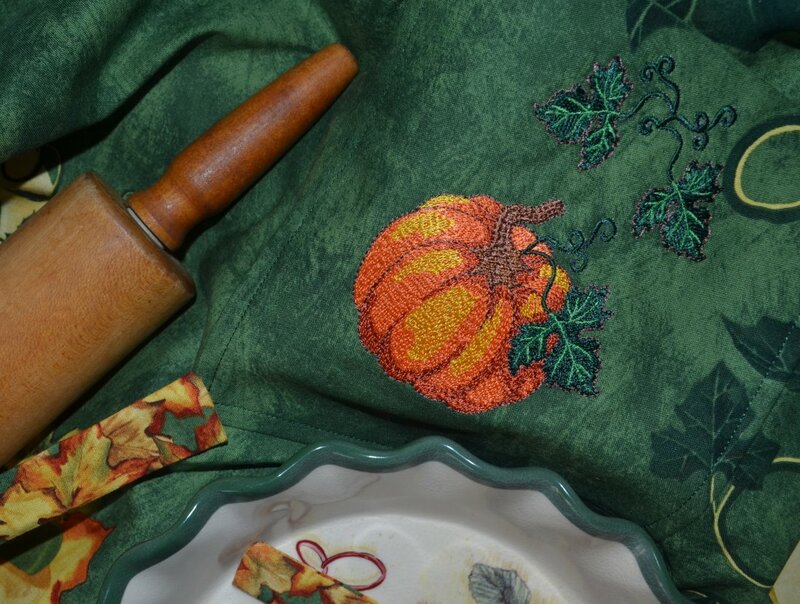 Pumpkins are ready for baking a few pies for the upcoming holidays, and while the chore can create a mess, the kitchen apparel need not be dull. 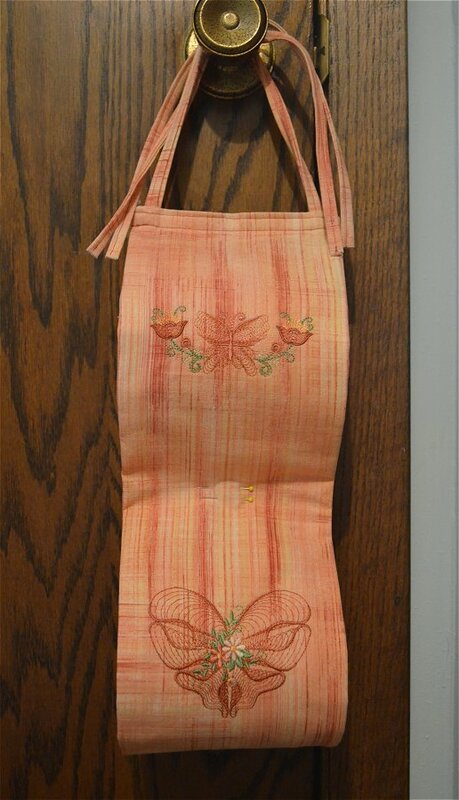 A festive apron will keep clothes flour-free, and just the right print will cheer up the scene. 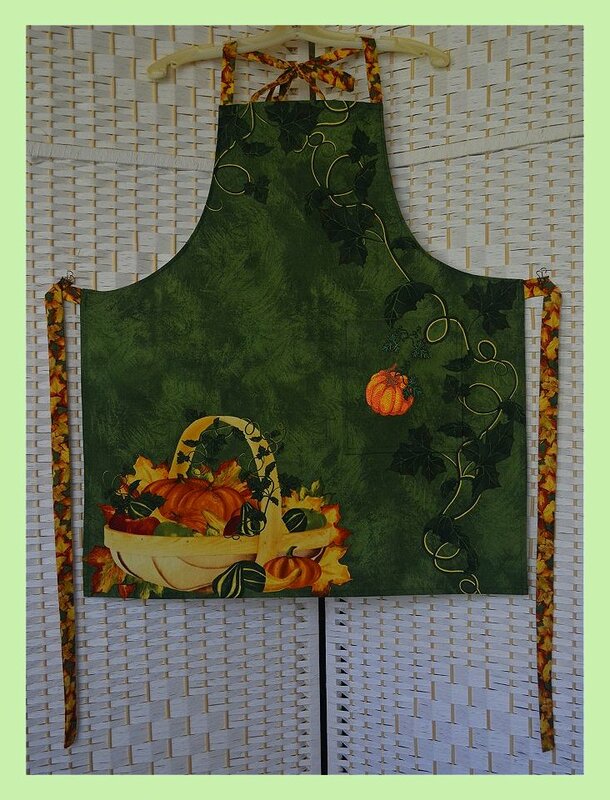 An apron panel “Beauty of Autumn” that also includes a square for making a pot holder, can be found with a quick online search. The print is obviously quite popular and understandably so. The colors are bright, the panel is easily assembled, and most inviting to the embroiderer, the print and fabric lends itself quite nicely to stitches. 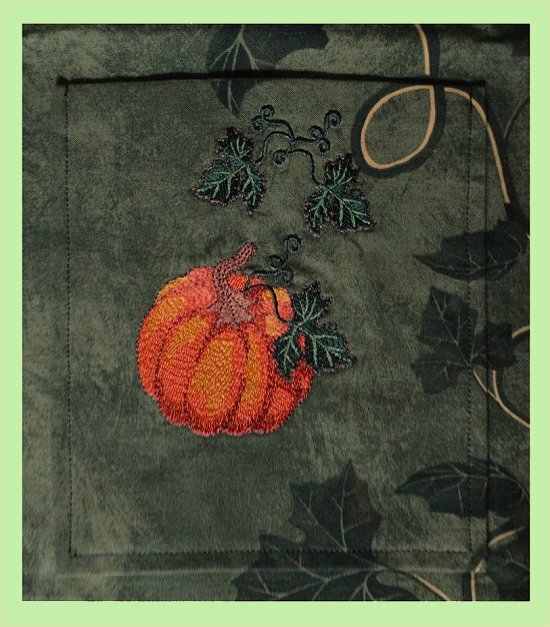 So, in my quest to refresh my seamstress capabilities, I purchased my panel and found the perfect embellishment at EmbroideryDesigns.com from an abundant variety of pumpkin designs. I decided to embroider only the pocket, but there are plenty of areas on the apron to decorate, if your imagination insists. Depending on your skill level and preferred working speed, the complete project takes about 5-7 hours (or more if your imagination gets carried away) and all skill levels can consider it easy. 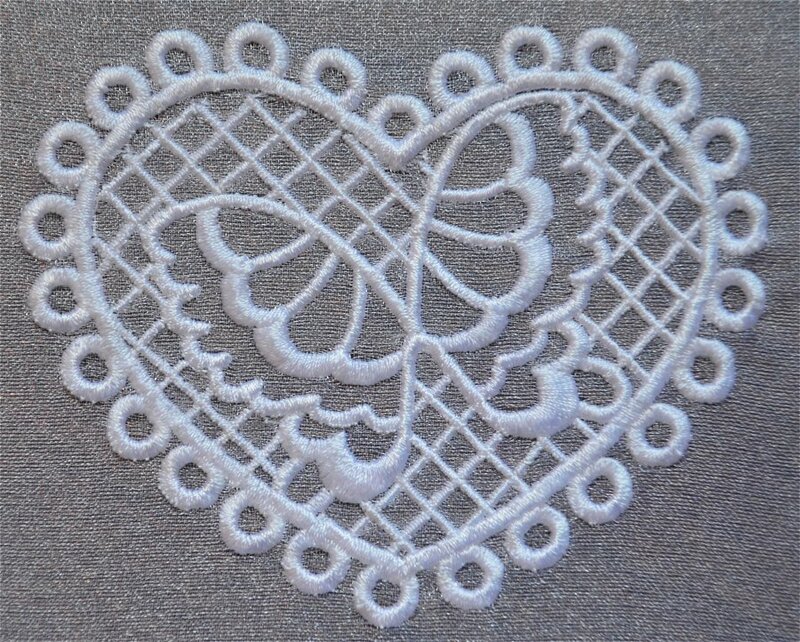 *More designs to choose from for your project at EmbroideryDesigns.com. Stitch a sample to test the design, as well as the colors. My first run revealed that the light orange thread I had chosen for the highlights didn’t offer enough contrast so it was back to the editing software for a quick check of which color might be a better idea. I decided on a gold that matched the print in the apron. The sample also revealed that my bobbin was in need of clean-up, as seen at the bottom of the pumpkin where the bobbin thread pulled to the top. Cut out the pocket square, leaving as much fabric as you can. This will help keep the fabric hooped taut during the sewing. Ideally, the entire panel could be hooped for the embroidery, but I find it best to work without the extra bulk when it isn’t necessary, whether it’s on a commercial single-head or my home machine. Hoop with a sheet of stabilizer and stitch. I was very pleased with the results of this design, as it sewed smoothly and resulted in a beautiful, flexible sew-out and not a “bullet proof” embroidery. But I was not happy with the placement. The pumpkin seemed a bit detached from the printed vine, so I decided to add a couple of leaves. 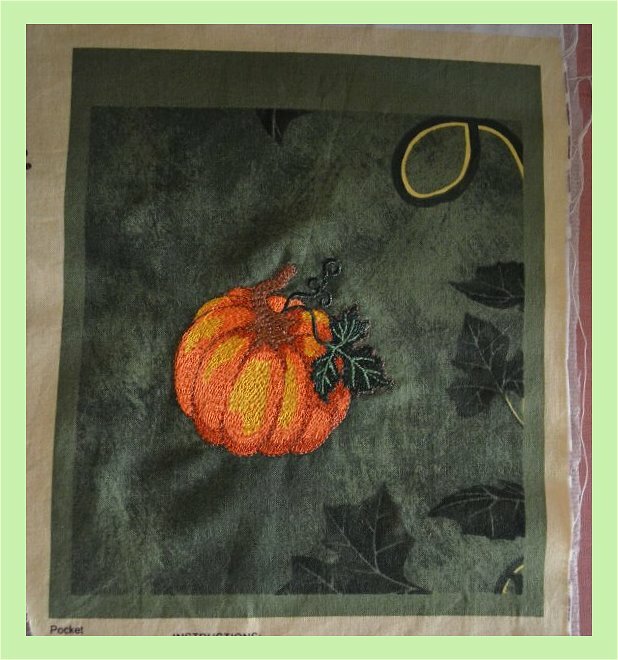 If you want to do the same, but haven’t the editing software, you can search through EmbroideryDesigns.com for a similar leaf design, or you could sew a few “vine lines” manually to fill in the open space and give the pumpkin more of a visual connection, or you might simply place the pumpkin design closer to the printed vine loop at the top right. I opened the design in Embrilliance Essentials and selected all of the colors of the leaf. Then I copied and pasted the leaf into a new design window. I pasted the leaf element again and flipped it horizontally. After placing each pasted section, I deleted the top curl and duplicated a small curl to place near the center. I also decreased the size of the two leaves about 10% so that it would fit nicely in the space available. I didn’t bother adjusting the color sequence for each color to sew once, because it was for one run, but more important, it assures that the veins of the leaves will sew where they should. The veins sew immediately after the fill of the section they sit on. If they sewed much later in the design, the fabric could shift and the veins would sew out of place. I then saved the design, re-hooped the pocket square and stitched. Remove the excess stabilizer or all of the stabilizer if you prefer. I used a poly mesh stabilizer that is as flexible as fabric, and with my history of wearing holes in apron pockets, I chose to leave most of it and create a layer of protection. I trimmed away the excess at the top and bottom to remove possible bulk and zigzagged the raw edges. Stitch the pocket to the apron. The process of lining up the print on the pocket with the print on the apron is a bit tricky. Be sure to follow the recommended seam allowance, iron the fold before placement and pin in place prior to sewing. 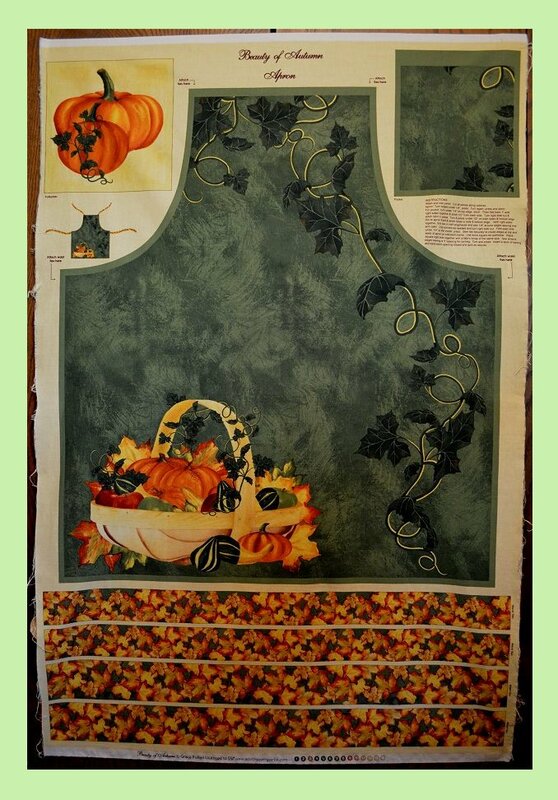 Finish sewing the rest of the apron. I used my cutting mat grid as a guide while pinning to help keep a straight hem, and I cut a couple of notches in the curve to remove the stress; this allows the hem to lay neater. To turn the ties, I used a knitting needle by pushing the flat head against the stitched end and worked it through until I could pull it right side out. And now to get at those pies! If you don’t want to flour up that pretty embellished apron, there’s plenty of pre-made pie crust options available at the grocery store that work just as well. Make the job even easier by using canned pumpkin puree and follow the tried-and-true recipe on the label. Whether or not you’re a pie maker, you can wear your new apron for other Autumn kitchen time, such as carving a Halloween Jack-O-Lantern. After the ghosts and gremlins are gone, puree and freeze the pumpkin in ice cube trays for smoothies later, and don’t forget to roast those seeds! ~ Till next time, keep on stitchin’! Everybody needs a pin cushion. Maybe you don’t think so if you’re not a seamstress or tailor, but think again. What do you do with those packaging pins you remove from new clothing before you wear it, or where do you poke that stray safety pin or needle and thread? Whether you’re a hand or machine embroiderer, you’ll need a temporary home for needles that are still new, but not the right size for the project you’re about to tackle. Heck, I even use pins to fasten fragile items onto my bulletin board so that they’re not damaged with a big tack hole. A pin cushion will find a use in every home, so why not make it as pretty as it is functional? 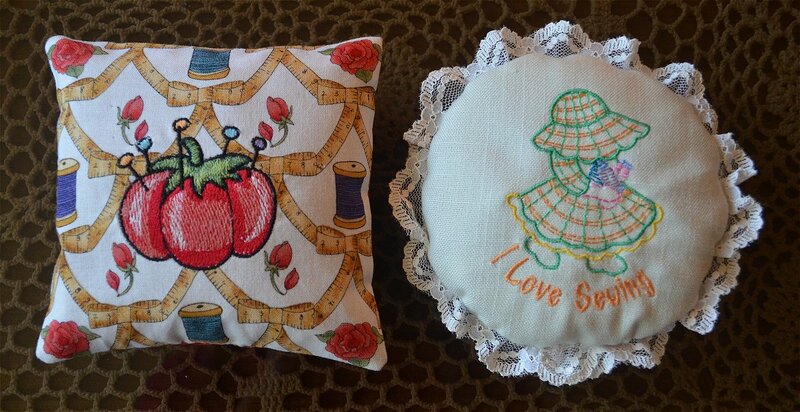 When embroidered with the right design for the person in mind, a pin cushion even makes a great gift! 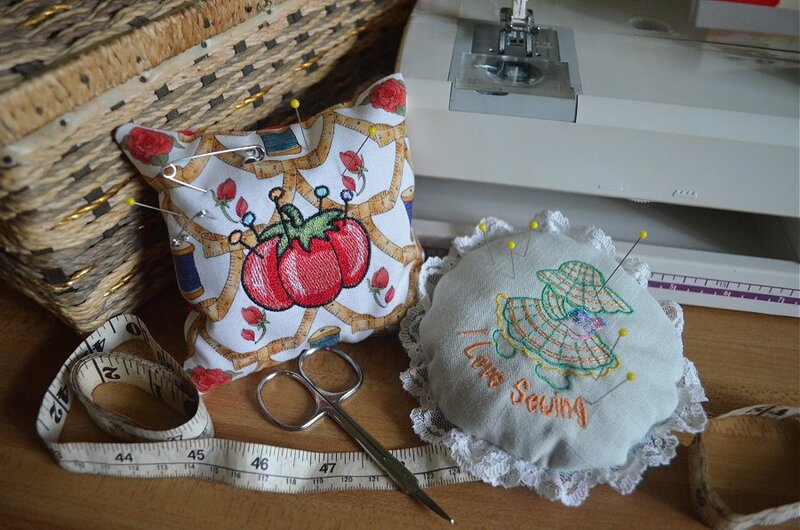 Traditionally a pin cushion was often seen as a tomato shape, a practice which is thought to have begun during the Victorian Era when tomatoes were considered a sign of good luck. But any shape can be made, as long as it’s stuffed with a material that will hold the shape, is flexible and that preferably offers some weight so that the pin is pulled from the cushion easily. It’s said that today’s pins are made to stay sharp, but I believe anything will dull over time, so if you will be avidly using the pin cushion, you might want to stuff it with a filler that is thought to keep the pins sharp such as fine sand, rice or flax seed. If you don’t experience nut allergies, you can try what I used for this project – crushed walnut shells used for reptile bedding and found at pet stores. It’s relatively easy to work with and the stuffing process is fast. Crushed walnut shells are inexpensive at about $8 for a 5.5 quart bag and can also be purchased from various craft stores by the cup. 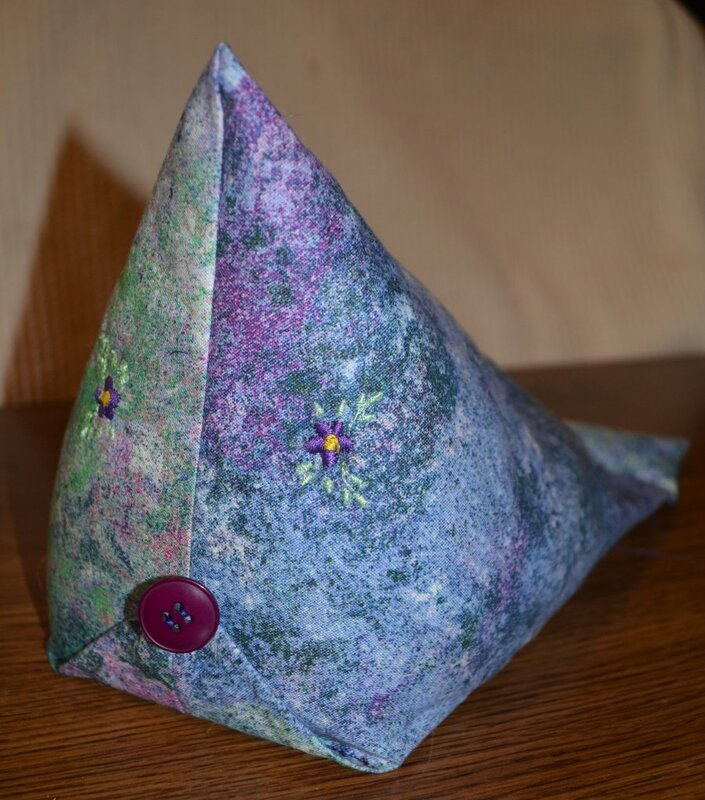 A pin cushion is a great way to use up those quilt scraps or most any type of fabric from cotton to felt. Embroidery on various prints will have interesting results, such as the fat quarter of an Alma Lynne Hi-Fashion print I had in my stash that I used for the square pin cushion. I found thread color tones of those recommended in the design color information to match closely with those used in the print. Trims from your stash can also be added, such as beads, ribbon, buttons and bows, to give this quick project your own special touch. 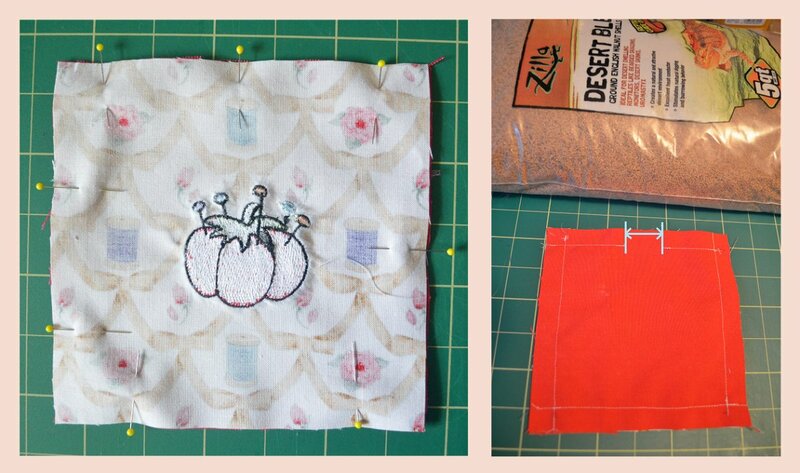 Step 1: Sew a sample of the design planned for your pin cushion. Gather the materials and choose the thread colors by referring to the color information included with each design and use the closest tones you have in stock to what will look best on the fabric to be sewn. Step 2: Hoop the fabric and sew. First, set the inner hoop over the fabric to decide where the design will look best, preferably balanced well at the center of other elements. 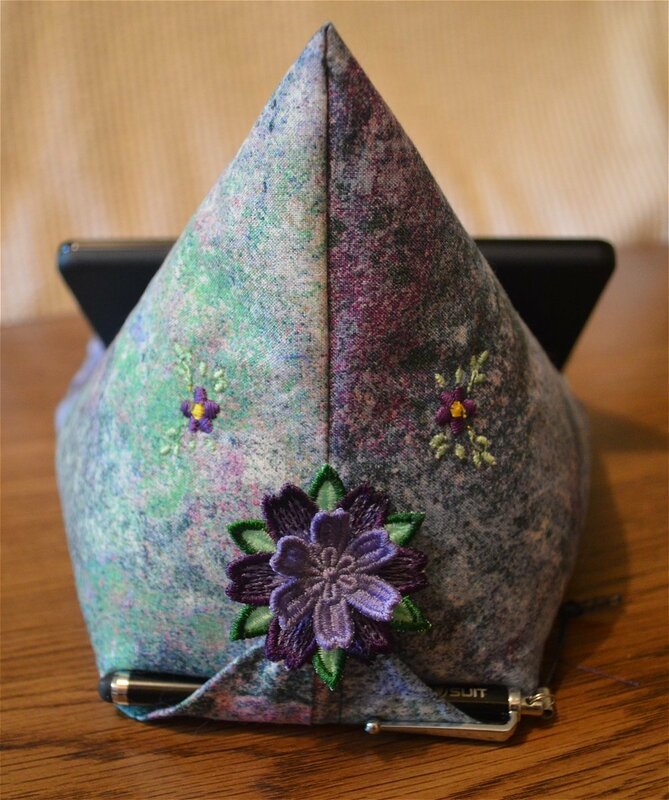 For this print, I wanted the pin cushion to result with the roses placed at the four corners. Then, hoop the fabric with the stabilizer and embroider. Step 3: Cut out the panels for both sides. For the square pin cushion, I trimmed away excess fabric, keeping the design at center of a 6″ square, and I used the roses at each corner as a reference. I used a rotary cutter and ruler to cut the straight lines, but a scissors will also work well when it is marked first as I did for the round pin cushion. 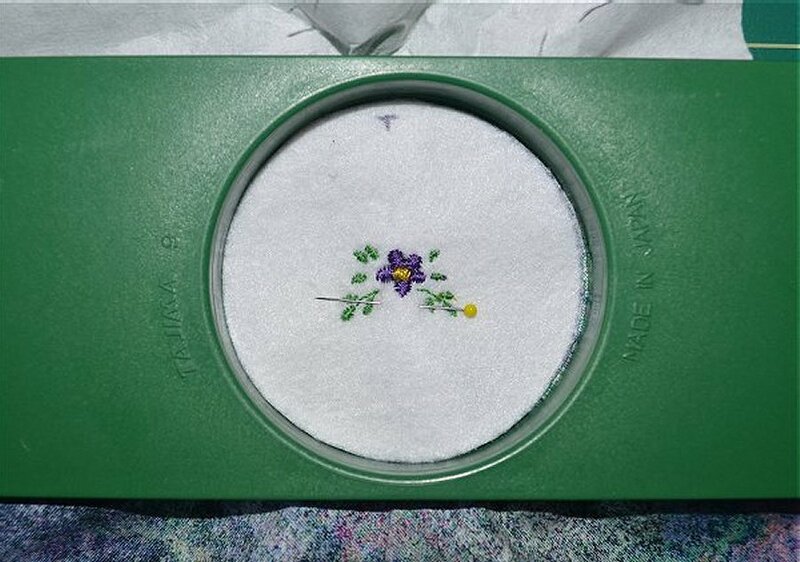 To keep the design at center of the round pin cushion, you can use a see-thru template or a cut-out circle made from shipping cardboard, or do as I have by using a 6″ glass lid from a bowl. Step 4: Attach a lace trim. To create a ruffle in lace trim, begin by calculating the length you will need to reach around the sides and include a few inches to the total. Then sew close to the edge with a long stitch length; this automatically causes the trim to ruffle. Pin the ruffled trim on one panel, with the stitched edge to the outside. Line up the stitches that made the ruffle with where you will be sewing the final seam (about ½” from the edge) and baste in place. Basting it to one panel will make it easier when stitching the seam. Step 6: Trim corners and turn. Remove some of the bulk by trimming away the corners. Turn by gently working the embroidery through the opening first and the rest will follow. Use an eraser or rounded end of a marking pencil or similar object to push out the corners; do not use an object with a pointed end. Step 7: Stuff the pin cushion and stitch to close. Set the turned pin cushion in a cup or bowl to hold it steady while pouring in the crushed walnut shells slowly through a small funnel. Close with a blind stitch. 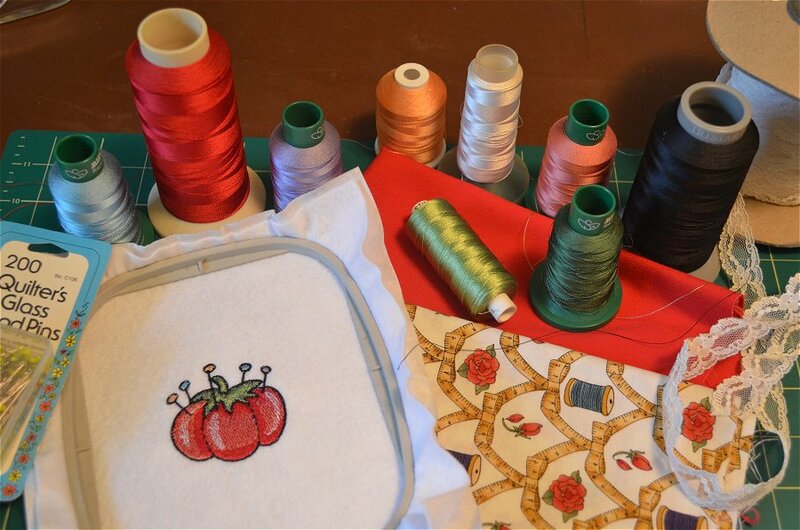 There are many shapes that can be created for a pillow style pin cushion from triangles to tomatoes, and they can be embroidered with the design of your choice. The square pin cushion with a weighted filler will stand nicely for small spaces, as well as display the design upright. You might also consider embroidery on the backside for a reversible option or to personalize. There are no strict rules! Just use your imagination and get those pins and needles organized! ~ Till next time, keep on stitchin’! 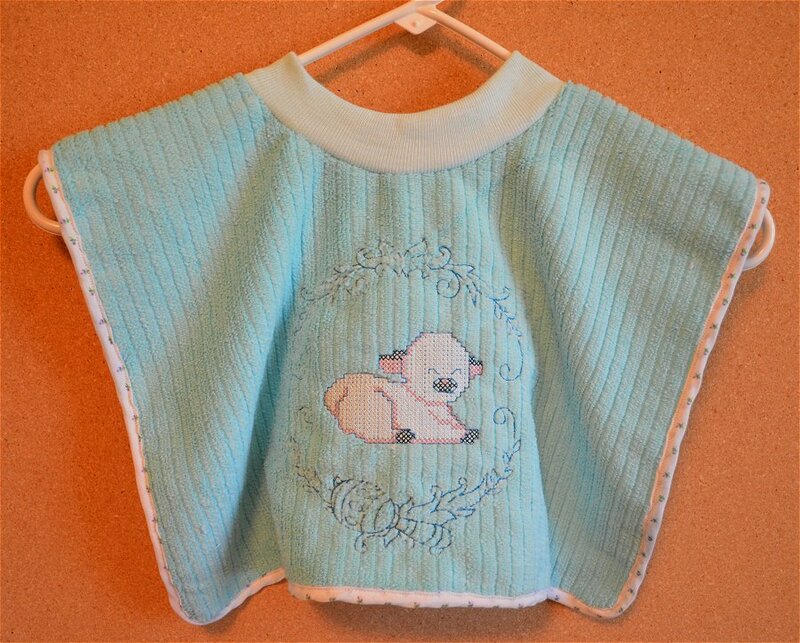 In my “new Mom days” I had been given a pull-over bib that offered the best stain protection and clean-up was easy. I admit, at first I had thought a tie-on bib was more logical to avoid the “drippings” from finding their way into my baby’s hair during removal, but after I learned to roll or fold the bib from the bottom to the neckline to catch the lost morsels before pulling it over the head, I had a change of mind. And the price can’t be beat! There are oodles of towels to be found at discount stores that come in bundles at a bargain. I found a 5-pack of microfiber hand towels for $3.85 and in a variety of bright colors cheery enough for gift giving, especially when embellished with a cute embroidery design. Assembly time for each bib is about 5 hours for a medium-advanced skill level, along with the embroidery sewing time, which of course, depends on the stitch count of the design you choose to use. I combined two designs and the total stitch count came to 8959 stitches; 20 minutes sewn at a slow speed. I chose designs that were created with minimal coverage of line stitches at a somewhat short length to keep the embellishment flexible and easy to clean. I used a 40 WT thread, but if the design is not stitch intensive, a thicker 30 WT might even work better on terry cloth or microfiber to allow stitches to be seen through the fabric fibers. Although I used a rayon thread for this particular project, a bib might fair better when laundered in hot water if sewn with a polyester or cotton thread. Also, cotton terry cloth may be a wiser choice if the bib will get tossed in the dryer, because microfiber should be air dried to extend its life. Step 1: Combine designs and test sew. 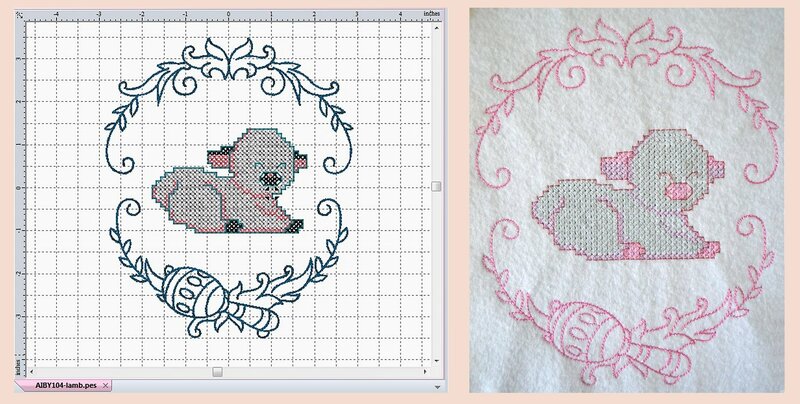 Merge the two designs in your editing software, arrange the lamb inside the frame and save as one design. Test sew the design on sample fabric such as felt. 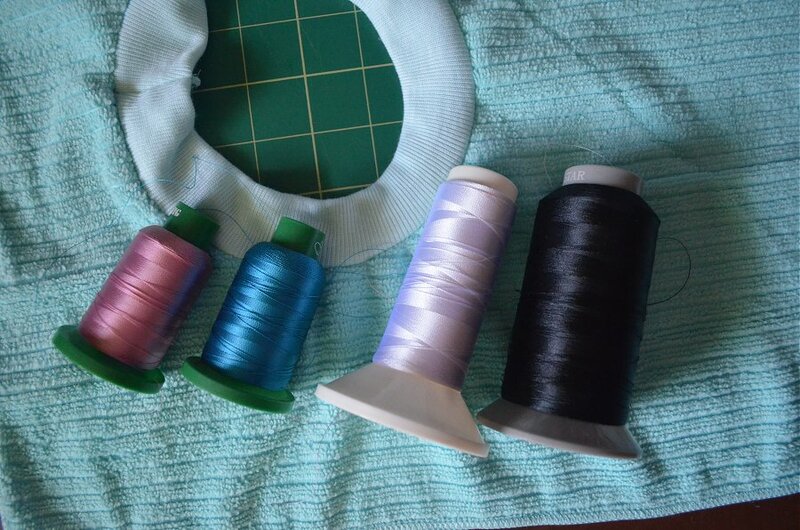 If you are unsure of what colors you will use on the final garment this is the time to experiment. For this sample, I used most of the colors found in the color information that accompanies the design files just to test the results. I also chose to use a silver for the “wool” in place of the white so that stitches would be clearly seen against the white felt. Step 2: Gather your materials and supplies. 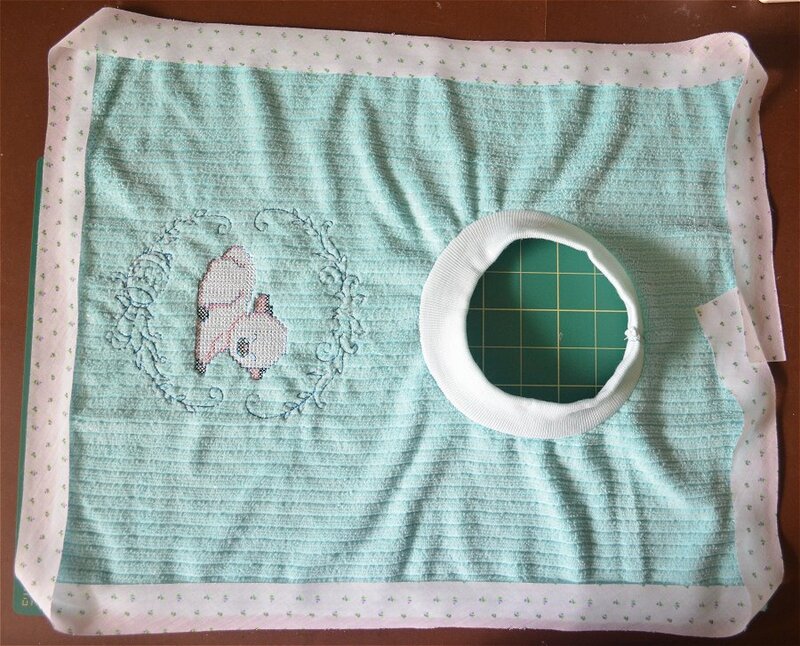 If you don’t have a sewing or artist’s template, you will also need something to use as a guide for cutting the neck hole in the towel; a small 6” dish or bowl works well for the average baby’s head. You can also measure the circumference of your own child’s head for a tailored fit, and choose an appropriate size dish or other item for a template. I had serged ribbing on hand, but if you don’t, then you will need to fold a 3-3.5” wide strip of ribbing along its 8” length and serge or zigzag stitch the open edge. Note, a serged/zigzag edge isn’t actually necessary because ribbing doesn’t fray, but it does help speed the sewing while pinning and stitching to the neckline. Step 3: Fold one third of the top of the towel to the inside with right sides together, lining up the side edges, and pin to keep the fold in place. 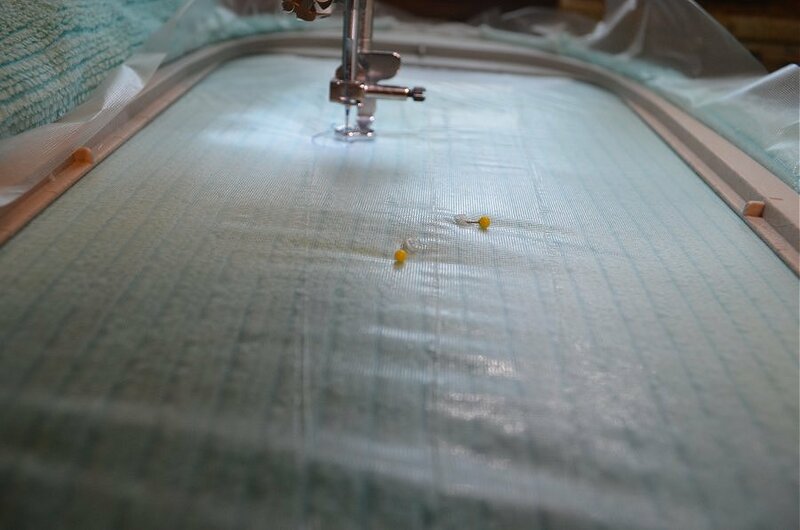 Lay the sewn sample in the approximate area where it is planned to be sewn to insure there will be a large enough sewing field. Set your template at the center of the fold, so that one half of the template is on the towel. I used a ruler to determine the half-way mark of the dish I used for a template. Also, be sure to measure from each side of the towel to the edge of the template to be sure the shoulders are of an equal length. Step 4: Mark the edge of the neckline around the plate and cut along the mark. 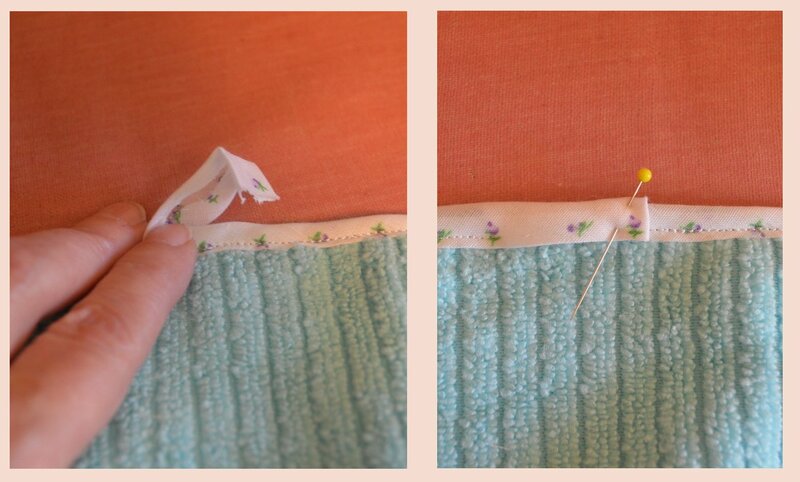 Unfold the towel and pin at four cross-points to use as a guide for pinning the ribbing on evenly. Step 5: With right sides together, stitch a 1/4” narrow seam to attach ribbing to the towel, starting and stopping about 1/2” away from the tails of the ribbing. Match the ends of the ribbing so that the outside folds meet evenly and serge or zigzag once or twice to close the ends and trim away excess ribbing. Stitch to finish the seam between towel and ribbing. Step 6: Choose the colors to use for the embroidery by laying them together on the towel. Do this in a well-lighted area to determine whether a particular shade will work well. 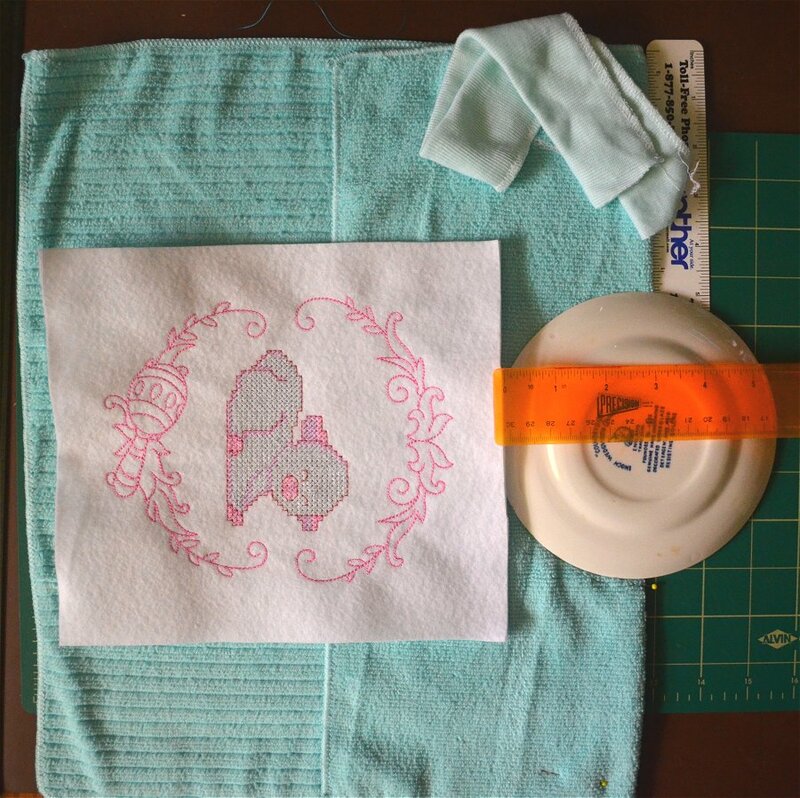 Step 7: Determine the center of the embroidery by folding the towel first along its length, measure to find the half-way mark and pin, and then fold along its width, find the half-way mark and pin. The center is at where the pins cross. Step 8: Hoop the bib with a poly mesh cut-away on the back and a water soluble topping. Rip away a bit of the solvy to expose the needle tops which will make quick removal easier. My bib is too short to be completely hooped in the 6.2 x 10.2” hoop, leaving about 1” of the bib un-hooped at the bottom, so I’ve made sure that the sheets of stabilizers are large enough to be completely hooped to help keep the bib taught and I pinned the edge of the towel to the stabilizer to help keep it in place (not seen in this image). Place the hoop in the machine and move the hoop until the needle is sitting over the point where the needles cross. 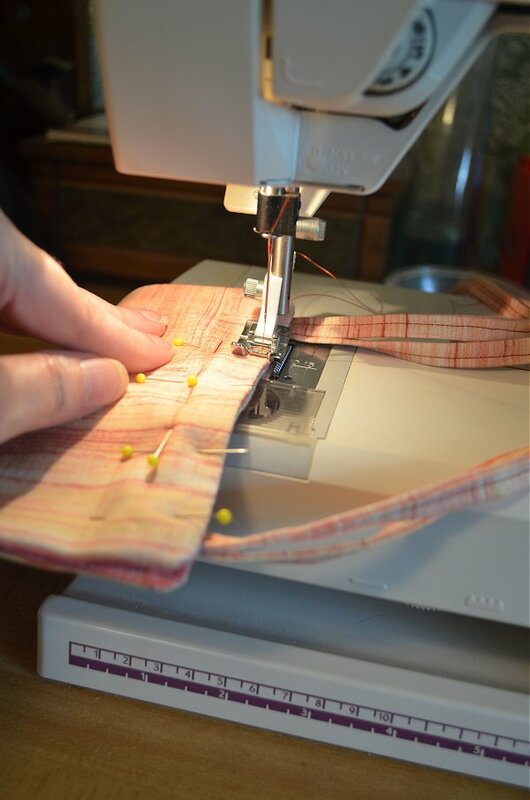 After sewing begins, stop the machine, remove the pins, and proceed with sewing. If the design you choose begins sewing at the center point, remove the pins before sewing begins. Step 9: After sewing, remove from hoop. Cut away the backing up to the outside stitches, leaving about a 1/4” allowance. There’s no need to remove the backing at the inside of the design if you use a flexible poly-mesh. On the front, rip away all of the excess topping. To remove from small elements, use the tip of sewing scissors or a seam ripper to get it started and pick away the excess. Note, you can also wash away the excess, but drying the bib would increase time before finishing. Keep in mind any remaining topping will disappear the first time the bib is laundered. Step 10: Cut a strip of bias tape at a length that will cover the edges of the bib to leave an approximate 2-3” overlap. I used a 16 x 19” towel that required almost 6 feet of bias tape. I also used bias tape that is 1.5” wide which made it difficult to attach to the bib after folding over the thick microfiber, so I recommend using bias tape that is at least 2” wide or wider. Step 11: Trim the edges where necessary. More often than not towels will have irregular edges, if only slight, but enough to cause an uneven edge. To be sure edges come out evenly, examine and trim by using a ruler for a guide and cut with rotary cutter or mark and cut with scissors. 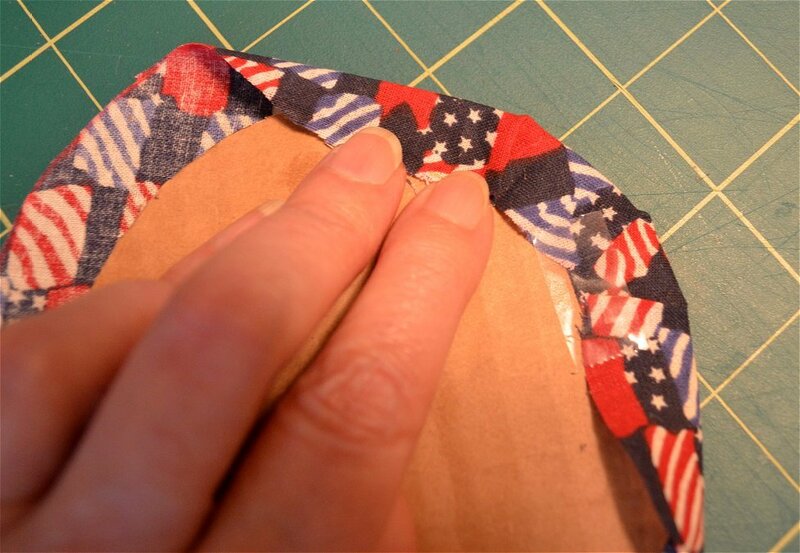 Cut away the corners to enable pinning the bias tape easily and to create a rounded corner. Step 12: If you’re not lucky enough to have a bias tape helper or bias-binder foot (as I don’t) you will have to do as early seamstresses did. Fold the sides of the bias tape to almost meet at the inside center, leaving a small gap to allow for the thickness of the towel and press. Pin the bias tape over the edge of the bib, beginning and stopping at the center back of the bib. Stitch near to the folded edge of the bias tape slowly, making sure that you catch the tape on the underside. (The wider the bias tape, the easier that process is.) Overlap the end of the bias tape and tuck the end to the inside. Pin and stitch the seam to close. Step 13: The bib is now completed and can be laundered to remove any excess water soluble topping. If you’re a beginner at sewing, don’t fear giving this project a try. 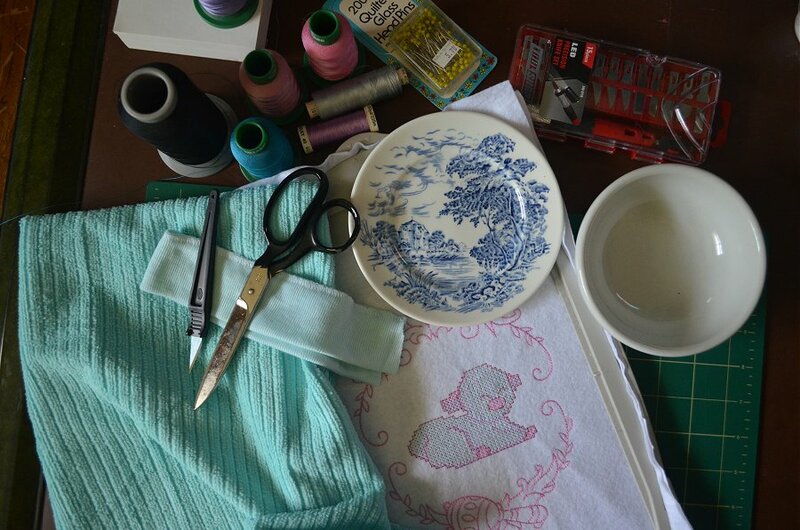 I hadn’t used my machine for anything but mending and embroidery for a couple of decades. I found it to be the perfect project that will either help you recall what you once knew or give you practice for those projects ahead, while at the same time, result in something quite functional and cute enough for that next baby shower! ~Till next time, keep on stitchin’! What Makes a Design FSL? 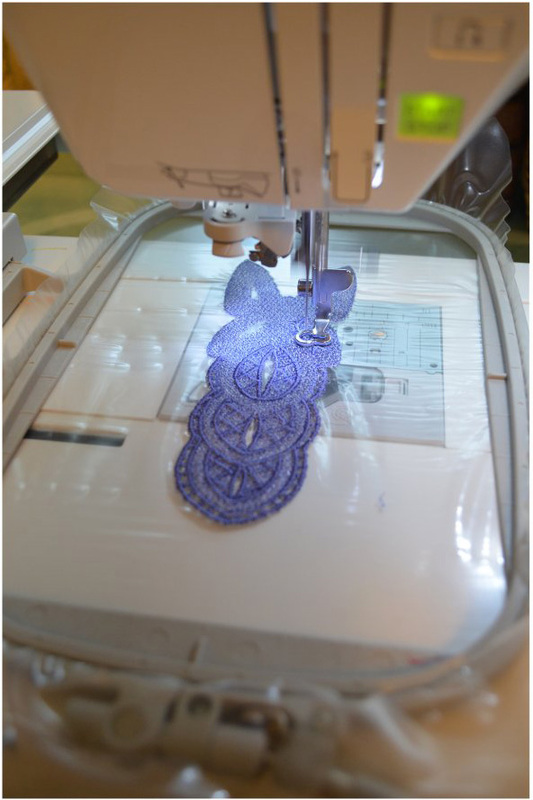 Freestanding lace, known as “FSL”, is a design that is embroidered on water soluble stabilizer, and when completed the stabilizer is washed away leaving the stitches free standing, as if they had been tatted or crocheted. 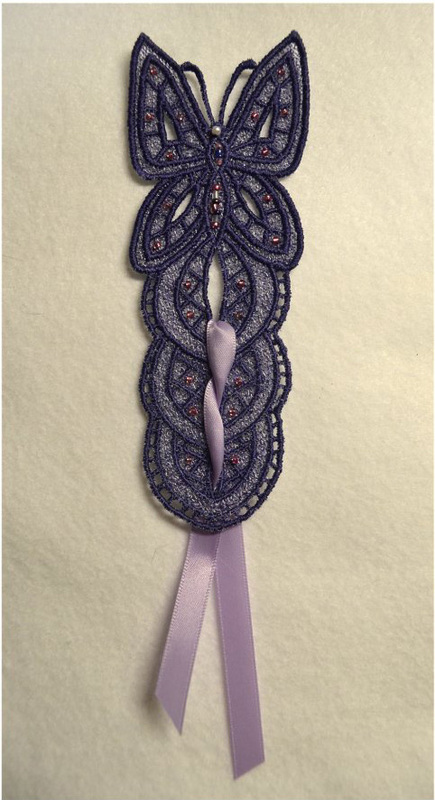 There are many designs, such as this bookmark, that have been specifically digitized for FSL by skilled digitizers and available at EmbroideryDesigns.com. There are also designs that look like they could be used for FSL, so beware! If they are not specifically digitized for FSL, they usually result in a frazzled mess. How can you be sure? Well, if FSL is not listed in the design title, believe it is not for FSL! Then again, there will always be those very occasional designs that might work okay for FSL, if only because they were by chance digitized correctly. When a customer recently asked if one of our Free Designs, Sweetest Heart ATG01-ATG-Val-01, could be used as FSL, I couldn’t resist testing the design. The page does not describe the design as FSL, and being a digitizer, I could see it would likely not hold up well, unless it sewed the foundation grid in a proper path. 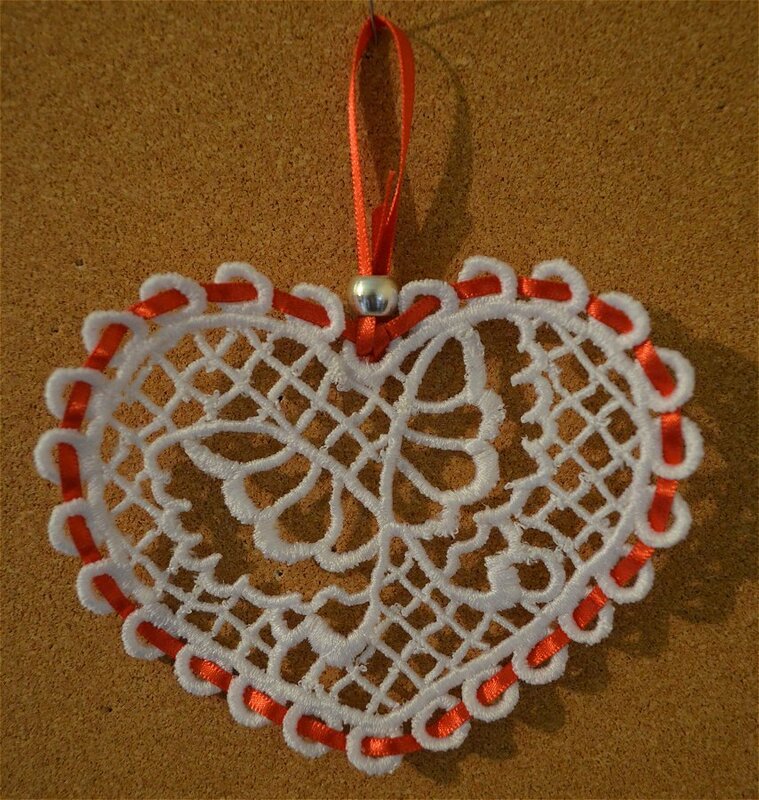 I could have run it through a slow redraw on my software to confirm my suspicions, but I decided to stitch it out to experiment and find just what could be done with this pretty little heart design that has received 5-star reviews. First, I chose the water soluble stabilizer from what I have in stock; a choice between a light-weight or heavy-weight stabilizer. I started with the lighter weight, using several layers, which is often sufficient for an appropriately digitized FSL design, but I stopped the sewing when I could see that the sewing path was not building a foundation to accommodate FSL. My curiosity led me to try again. I switched to one sheet of the heavy weight stabilizer and completed the design. Fresh out of the hoop, the design appeared okay, but a closer look revealed the areas near junctions that were beginning to pull away. I dared to continue with the usual procedure by cutting away the excess stabilizer and then I let it soak for a minute in a dish of lukewarm water. I was surprised to see how well it was holding up, until I began rinsing the design under the tap. The stitches began to fall apart from just the water pressure. Final results: not so pretty. Now, you might think I would give up at this point, but I just had to try it for FSL one more time using three layers of the heavy-weight stabilizer, wondering if I don’t rinse all of the stabilizer away, whether the design might stay “glued” together enough to be used for something that won’t get handled often, such as a holiday ornament. The test once again proved negative, and even without much rinsing there was unraveling occurring at various junctions. But, being that I am one who hates to toss anything, I did manage to salvage what I could by hand stitching the vulnerable gaps together at the junctions and polished it off with a bead and a bit of ribbon. It’s now suitable for perhaps the back of the Christmas tree. Then I decided to try the design as recommended by one of the reviewers who stitched it on organza to create a window dreamcatcher. I used organza (non-silk) with two sheets of heavy-weight water-soluble stabilizer, though I believe now that one sheet may have sufficed. 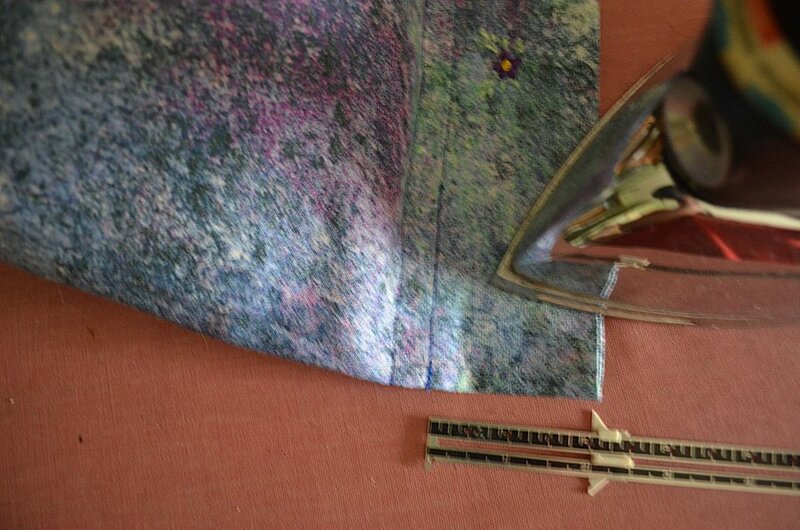 The excess stabilizer was cut away without cutting the fabric and not a stitch unraveled under the tap. The results of the organza lace were quite pleasing and it now awaits my construction of the dreamcatcher – a project that I promise to finish and share another day. 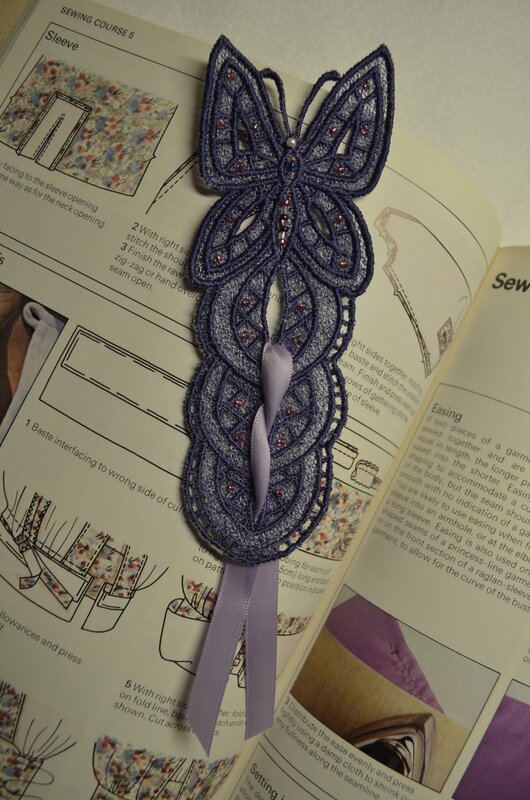 So, what design can you use to create freestanding lace? An FSL design must be digitized with a foundation of non-stop lines that build a strong grid in order to avoid the fiasco of unraveling when the stabilizer is rinsed away. When a design is created specifically for FSL the product pages at EmbroideryDesigns.com will include “FSL” in the title, such as the bookmark design: FSL Butterfly Bookmark D by Pat Williams. Following are the steps I used and you can also find instructions for this bookmark at EmbroideryDesigns.com. Step 1: Hoop stabilizer and sew. Step 1: Hoop the two sheets of sturdy heavy weight stabilizer in a hoop of at least 5″ x 7″. The stabilizer must be hooped taut and you must use a heavy weight stabilizer for the best results. Sew the design. Step 2: Remove stabilizer and let dry. Step 2: Remove from the hoop. Cut away excess stabilizer from around the outside of the stitching and place in a dish of lukewarm tap water for a few minutes. Rinse under tap water. 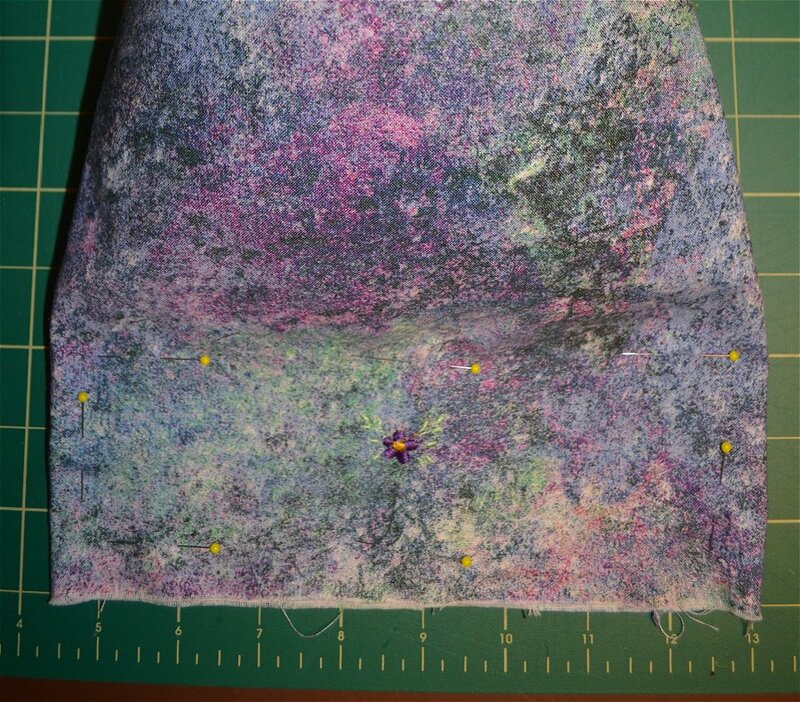 Block (adjust and shape stitches) on a paper towel and cover with another paper towel. To avoid the design from curling and losing its shape, rest something heavy like a cold iron on top and dry overnight. Step 3: Decorate by sewing the beads where you desire with the same color thread as the bookmark. Use the small pearl-like bead for the head of the butterfly. Tuck the ribbon through the top hole at center of design, pulling through about halfway. Lace each end of the ribbon in and out, through the middle and bottom holes, with both ribbon ends tucked through to the back of the bottom hole of the design (as seen in image). Tack ribbon in place with a couple stitches at the back and bottom of bookmark. So there you have the bad and the good of FSL. Use the right design and the right materials, and you’ll create a precious treasure. We have many FSL designs to choose from that will help you create bookmarks, decorative trims, holiday ornaments and so much more! 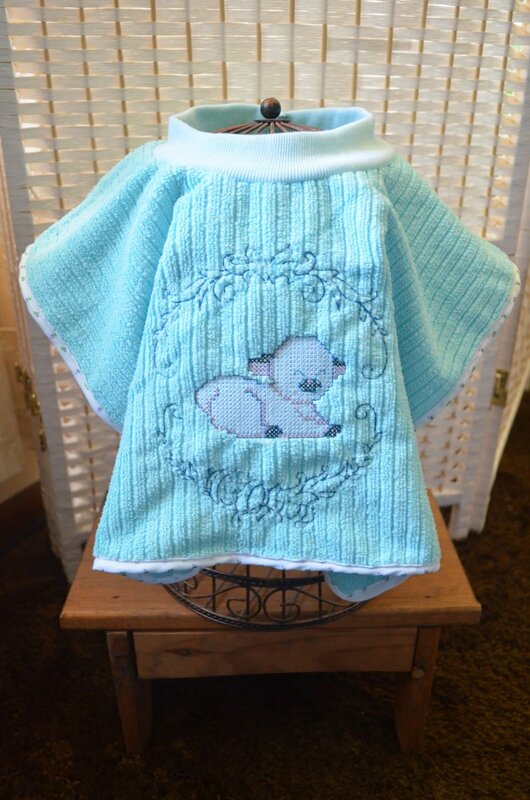 Come browse our collection of FSL Designs at EmbroideryDesigns.com and find your next project! Remember, your comments or suggestions are always welcome. If you have tried this project, I’d like to hear what you have done! You’re invited to comment here or please share your ideas in a review on the design project page. Till next time, keep on stitchin’! Looking for a way to perk up your Memorial Day celebration? This project is perfect for a colorful centerpiece at your BBQ party that will make your guests smile! As I was making this, I also considered placing one of the skewered shapes in a memorial bouquet, or even using just the shapes to dress up the fridge by fastening a magnet on the back. You can use the suggested designs or some of your own favorites. 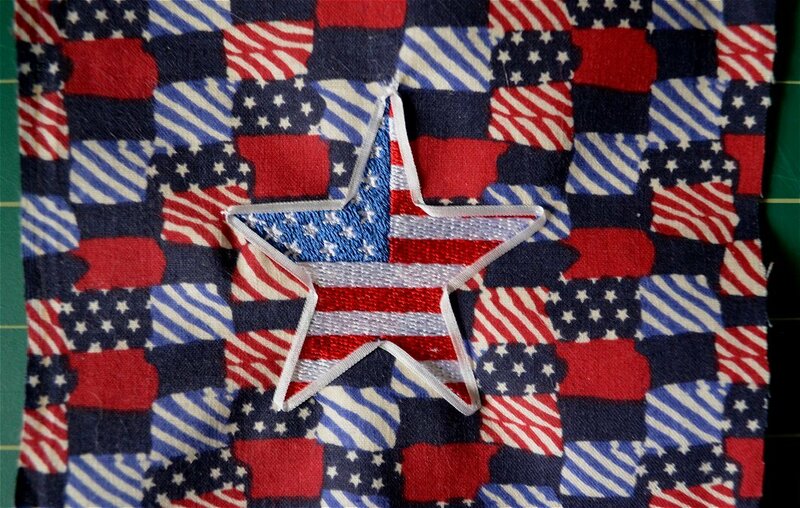 Or you can choose from the patriotic designs now a part of the Memorial Day Sale at EmbroideryDesigns.com! The project can be completed in a 3.93 x 3.93″ sewing field and by all skill levels, if you have the available materials and time. It will take about 8 hours, depending on how many skewered shapes you decide to make, as well as the sewing time necessary for the designs you choose to use. Keep in mind that the materials used are my suggestions and measurements in this project are close, but approximate. You should choose your patriotic designs, gather up your choice of materials, and make adjustments to your own needs and imagination! Skewers – metal or wood: 1 17” and 2 11”. Step 1: Set up designs in software. Step 1: Merge designs for the star shape. Open the Flag Ribbon design GSD01-ICG350 in editing software. Select the entire design and copy. Open a new window. Paste the ribbon into a new window. Open the USA Heart 1 design SME01-US-189, select, copy, and paste it to the left of the ribbon in the new window. Then paste again to the right of the ribbon. Use a guideline to help line up the two USA Heart 1 designs evenly. Check size and decrease if necessary to fit within a 3.93 x 3.93” area, so it will fill the available space inside the star shape. Save the new window as one design in your machine format. For the round shapes, open the two designs, Red, White and Blue Flower DC01-HY0844 and American Star FES01-EMP200804003, in your software; adjust the colors, if necessary, and save in your machine format. Step 2: Gather materials and sew. Step 2: Gather materials and sew the three designs. Stabilize each design with two layers of 1.5 OZ tear-away or one sheet of cut-away cut to the same size as the fabric pieces being sewn to form a sturdy back. Remove the embroidery from the hoop. Do not remove the stabilizer. Step 3: Create cardboard insert. Step 3: Create a template for the star shape. Print an 8” star shape and cut out the star center using a craft knife. Use the template to mark and cut-out a star from the cardboard for the insert. Step 4: Create the star shape. Step 4: Assemble the star shape. With the stabilized back facing up, center the finished design inside the printed template and mark the star’s edge. Cut only the stabilizer away along the marked line, leaving the stabilizer intact in the center of the star. Then mark a cut-line about ½” away from the star’s edge on the fabric and cut away the outside excess. 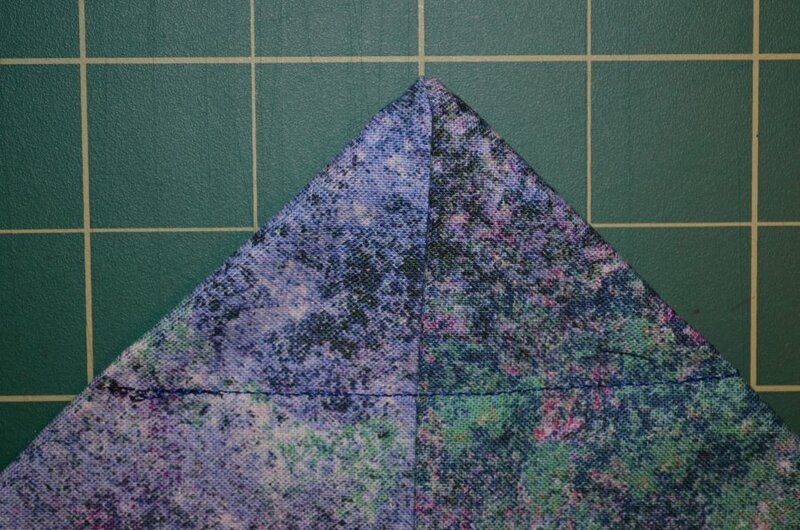 Make a small cut on the fabric at each inside corner of the star from the outside edge up to the stabilizer to allow folding back the fabric edge to lay flat. Glue the fabric edge to the stabilizer and clamp with paper clips or binder clips until dry. For the back of the star, use the cardboard star insert as a guide to mark the remaining 9 x 9” piece of red fabric. Then, mark about ½” away from the mark of the star outline. Cut the inside corners up to the star outline. Wrap the margin of fabric over the cardboard edge and secure with tape. Step 5: Attach the gold trim to the front of the star. Measure and cut a piece of trim for each side, leaving a ¼” tail past the point. Secure to the edge of the star with fabric glue, overlapping the ends of trim at the corners neatly; clamp with binder clips and let dry. Where the trim meets at each point, cut the excess of one piece of trim to end exactly at the point; overlap the longer piece over the shorter piece and wrap over the point edge to the back; glue to the back; clamp with binder clips and let dry. Step 6: Attach front of star to back. Step 6: Finish the star shape. Secure the front to the back with a thin line of glue at the edge; clamp with binder clips and let dry. Be sure to leave an opening at the inside corner between the two bottom points to allow for the skewer. Push the 17” skewer through the opening between the back fabric and cardboard. 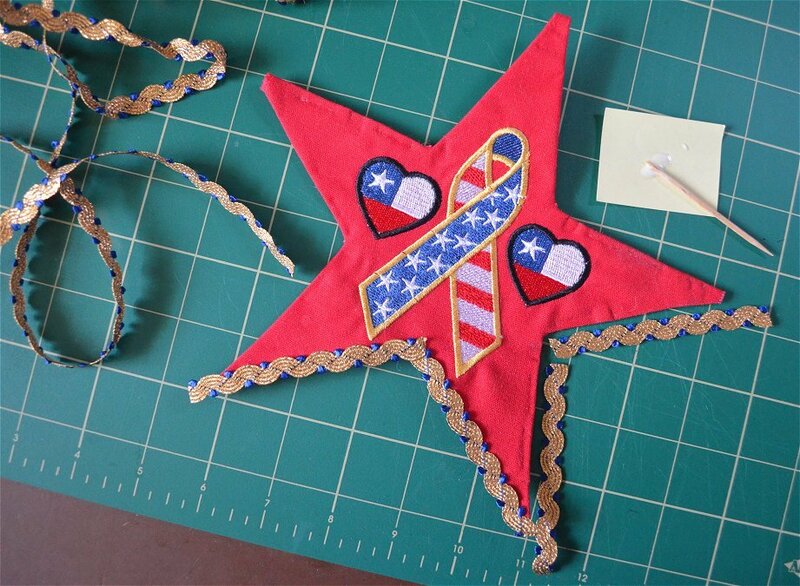 Step 7: Add ribbon to American Star design. Step 7: Begin the round shapes. 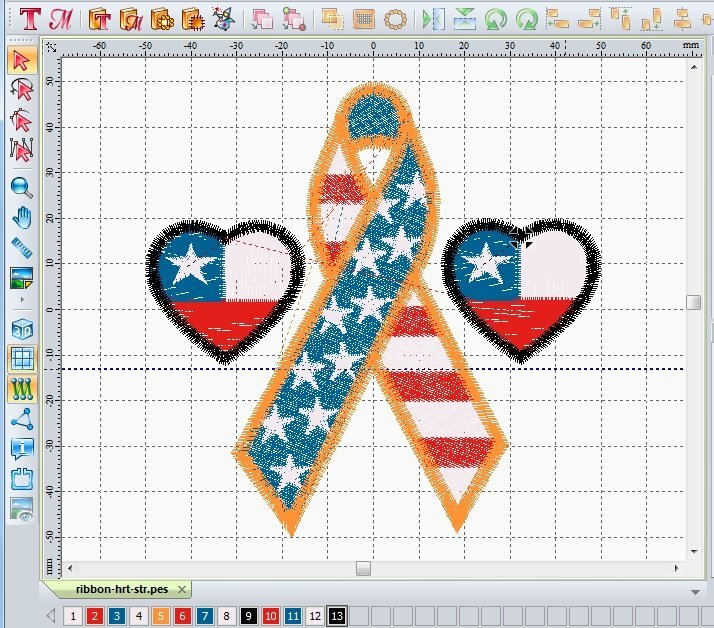 Fasten the 2 MM wide white ribbon to outside edge of the embroidered American Star with a couple small stitches using the needle and thread. Stitch at the points and corners, folding the ribbon over after stitching so that it continues around the embroidered star neatly. It is not necessary to tack down the entire length of ribbon. Step 8: Prepare round front. Step 8: Cut out 4” round cardboard inserts. Use a 4” see-thru protractor to mark a cut-line around the design on the stabilizer, centering the design by measuring between each point and the circle about ¾” or (20 MM). Cut only the stabilizer along the marked cut-line. Step 9: Attach front to insert. Step 9: Measure and mark a circle on the fabric about ½” away from the stabilizer edge and cut. Wrap the fabric back in gradual folds over the edge of the cardboard insert, spacing the folds about every ¾” so that the fabric lays smoothly along the edge; secure with tape. Step 10: Stitch on trim. Step 10: Attach the prepared gingham and eyelet trim. Lay the strip around the edge, making folds about every ½ – 1” so that the trim lays flat and pin to hold in place. With needle and thread blind stitch between the fabric and the eyelet trim around the edge. 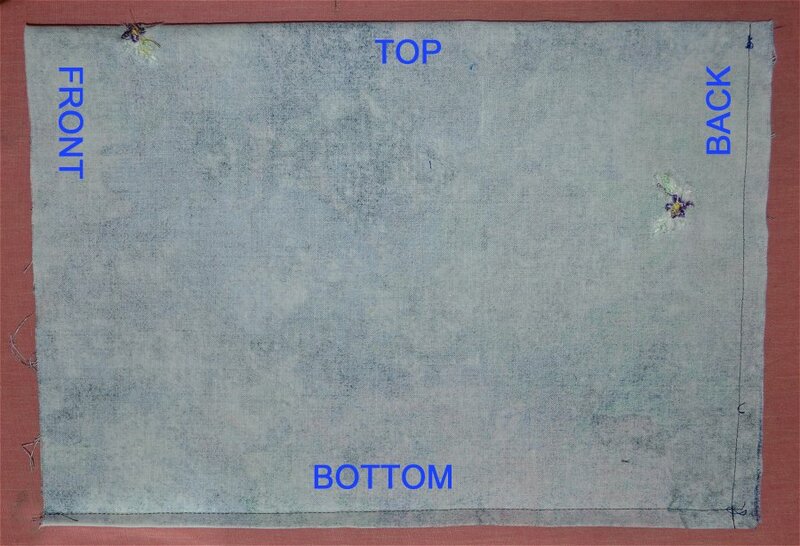 On the back, tack down with a couple of small stitches at each fold. Step 10: Attach felt to back. Step 11: Mark and cut 4” circles from the felt. Glue around the outside edge, leaving an opening for the skewer at the bottom and secure to the trim on the backs of the round shapes; let dry. Step 12: Finish and arrange in vase. Step 12: Decorate the Red, White & Blue Flower design with the star stickers. Push the 11” skewers into each of the finished round shapes. If necessary, secure the finished shapes to the skewer with a small piece of tape. Fill the vase with marbles, sand or colorful fabric (red felt used in image). 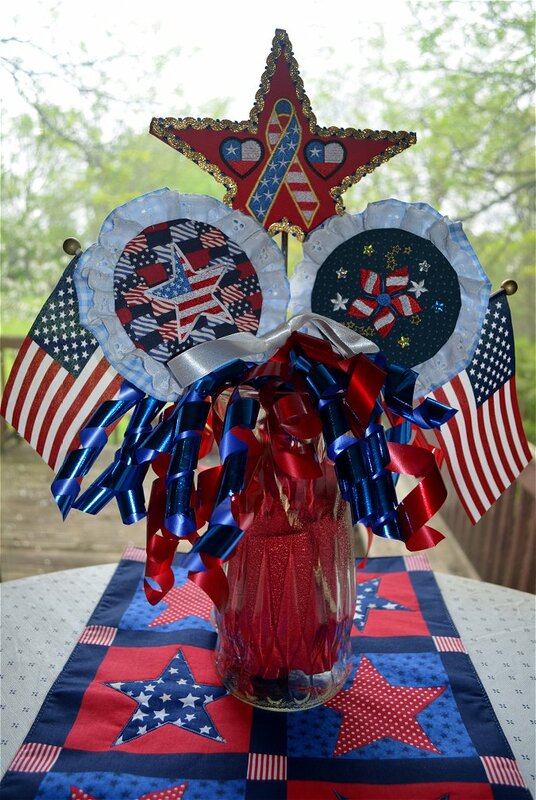 Arrange in the vase with the decorative USA flags, ribbon and/or garland. I hope this project will help you celebrate the day as we remember with appreciation those who bravely fought for our freedom. Till next time, keep on stitchin’!